Community bank directors should not be rubber stamps for senior management, the Federal Deposit Insurance Corp. warns banks in a special issue of Supervisory Insights focused on corporate governance. The report, “A Community Bank Director’s Guide to Corporate Governance: 21st Century Reflections on the FDIC Pocket Guide for Directors,” offers fresh perspectives on the pocket guide first published in 1988. It reminds bank directors that they must instill a “strong risk management culture” at their community banks. It’s their job to use “independent judgment,” which sometimes means challenging senior managers. Community banks with higher risk profiles should have stronger risk management practices and more intense board oversight. That doesn’t mean they must hire outside consultants, but they are expected to understand and monitor the bank’s risks. Troubled banks that survived the crisis were more responsive to supervisory concerns than those that failed. 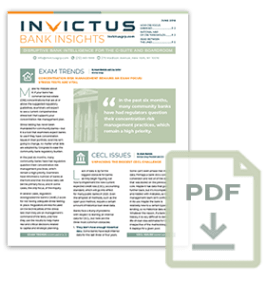 Directors should personally review exam reports and other regulatory communication and make sure they track progress in addressing problems, the FDIC advises. The report says that “the quality of the institution’s planning process is a key consideration in the appraisal of bank management, earnings, and capital.” Examiners look at the entire planning process to assess whether it is sufficient, whether the right people are involved and the “reasonableness of assumptions regarding the bank’s present and future financial condition, market area(s) and competitive factors.” They also look at whether the plan allows the bank to change direction when conditions change.